Should de Blasio Have Taken Cuomo’s Deal on Universal Pre-K? The mayor signals he might accept universal pre-K without a tax hike. He might be in a better position if he had made that move weeks ago. During an appearance yesterday on MSNBC's "Morning Joe," Mayor Bill de Blasio gave the strongest indication yet that he could live without the tax on high-earning city residents he wanted to impose to pay for universal pre-K. If Gov. Cuomo's plan to pay for pre-K out of existing state revenue offered enough money, it'd be acceptable, de Blasio said—although he was quick to add that he still disliked the uncertainty of having to get the program funded each year through the state budget process. Caveats and all, this was a significant move on the mayor's part. Throughout the campaign and the transition, de Blasio made a point of not even entertaining questions about a Plan B, as in, "If the state doesn't pass the tax hike, what's your Plan B to pay for pre-K?" De Blasio's boilerplate retort was a brief explanation of why it's bad strategy to bargain against yourself. Now, albeit rather tepidly, he's signaled there's more than one way to slice the UPK apple. Many smart people think the mayor should have done this a long time ago. Just this weekend, I ran into a City Council member in a pizza shop. "He could have taken the governor's money and claimed victory," the member said, shaking his head. Weeks ago, the smartest person I know emailed me: "If Bill had quickly taken Andrew's deal, some of the tabloid s–t he's taking now wouldn't have happened." De Blasio's reputation as a shrewd political player is hailed by both friends and foes. Friends see it as the asset that allowed de Blasio to rise from afterthought to presumptive mayor in a matter of weeks last summer. Detractors say de Blasio deals in strategy more than in soul—that expediency trumps principle too often. Whatever interpretation you subscribe to, it would be ironic if the master strategist blew the game planning around his signature policy. But I'm not convinced that he did. The argument for taking Cuomo's offer of a "blank check" from state coffers is that it represented a huge concession by the governor during an election year and was probably the best de Blasio was going to get. Pushing further—in hopes of getting the dedicated income-tax surcharge—risked creating a rift between City Hall and the governor's office and wasting the mayor's political capital to no apparent end. Taking the UPK deal would also allow de Blasio to spend that capital on other priorities like Vision Zero and hiking the minimum wage. And it would give city policymakers that much more time to plot out the massive task of getting UPK up and running in the city. But don't forget that Cuomo, at least initially, didn't offer an alternative way to pay for de Blasio's UPK plan; instead, he offered a way to pay for a smaller plan without raising taxes. Cuomo's budget message mentioned dollar figures that were well shy of what de Blasio needed for the city, let alone what would be required statewide. Cuomo then offered the "blank check," but de Blasio was right to point out that the state has made—and later welched on—such promises in the past. What's more, in late January and early February, de Blasio seemed to have the momentum. Cuomo had gone from lukewarm support of UPK to full embrace. Was it that hard to believe that the gov might move farther, especially given the fluid factionalism in the state Senate? I dunno. >Compare the downsides of the two approaches. 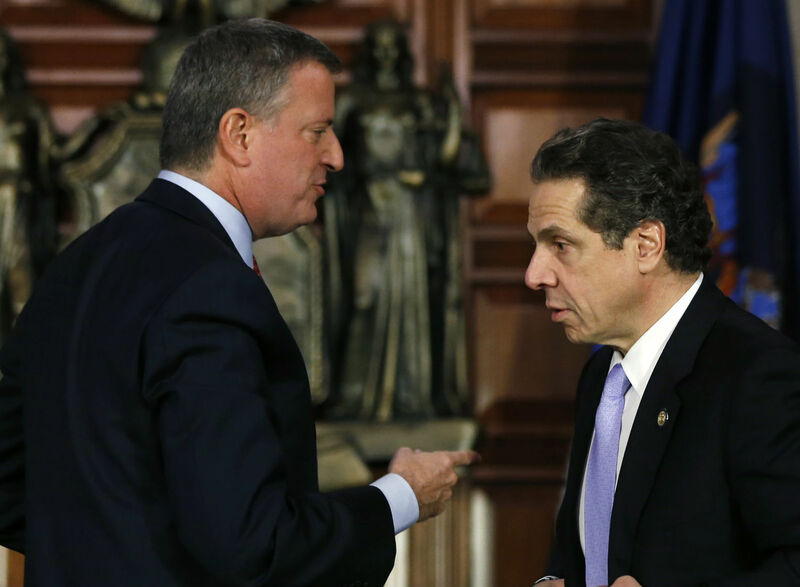 If de Blasio takes Cuomo's deal, then that's all he gets. If de Blasio pushes for more, maybe be gets more, or maybe he doesn't, but it's unlikely that he loses what the governor has already put on the table. Under almost any conceivable scenario there's a UPK program statewide next year, and there's no denying that's because de Blasio gave the issue some political luster, so the mayor can still claim a victory. At worst the mayor looks a little foolish for playing Icarus to Cuomo's sun, but so what? Mayor Bloomberg lost some big fights in Albany (West Side Stadium, congestion pricing) but was still able to prevail on others. The losses—especially on congestion pricing—only reinforced Bloomberg's reputation as an independent thinker. Indeed, when you read about de Blasio's missteps—and he's made some—and his sagging poll numbers, it's important to remember that he is taking flak this month in part because he's keeping his campaign promises: to end free charter school co-locations that were harmful and to seek a tax on rich people to pay for universal pre-K. I'm not saying that alone justifies the strategy, or excuses fumbles like Chancellor Farina's unfortunate "they're on their own," but it's just worth noting as somewhat unusual. Talk to turned-off voters about what turned them off, and more than likely they'll say it's politicians who break their word. So far, that's one complaint that won't stick against de Blasio.